I figured out the roast chicken thing, and I am a happy camper today. I’ve told you before that my family is not a fan of roast chicken. Bunch of freaks. I mean really–ask any professional chef what their last meal on earth would be if they could choose, and chances are the answer will be roast chicken (somebody actually did that, by the way, and that really was the answer. I think there’s a book about it.). Cooked properly, a whole chicken is divine. It is simple and delicious and comforting and relatively simple, and my husband and my children complain about it as if I’ve snuck cyanide beneath its wings every time I pull one out of the oven. It’s been a significant bone of contention around here, to be honest. I continue cooking meatballs and pizza quesadillas and all sorts of things they love (I love them too, but still), and I avoid the beautiful roasters at the grocery store just so I don’t have to listen to the moaning over a bird. A BIRD. Honestly. It’s ridiculous. So last night, DH was out at some work event and I grilled up a piece of beef for the kids, and I pulled a chicken breast out of the fridge and wondered what would happen if I roasted it just like a chicken–just that one piece. And I tried that. What happened was what common sense says: I had a wonderful roast chicken dinner, just for me, and it was a thing of beauty. The best part of this is that it is a one-dish meal, and it’s a dice-and-dump to boot. Chop chop, dump it in the pan, throw it in the oven, wait a bit, and voila. Dinner. Dinner worthy of a last meal, in fact, if we’re going to go there. I admit that I hummed to myself as I ate it, because the simple act of roasting a bit of a bird all for myself was a true delight. Heat your oven to 400 degrees and spray a small casserole dish or baking dish (a bread pan would be great, but line it with foil so your next loaf isn’t savory) with olive oil or cooking spray. 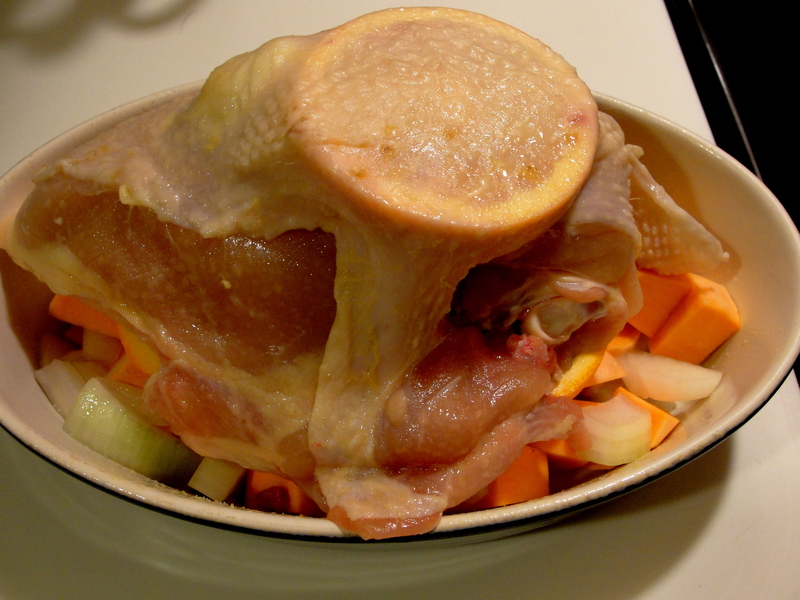 Take your chicken breast and loosen the skin with your fingers to form a pocket. Into that pocket, slide your last fruit slice and the other clove of garlic. Spray that baby with olive oil, and gently lay it on top of the fruit and garlic in the pan. Slide it into the oven and roast it until it’s done (160 degrees internally), which was about 40 minutes for me. Let the chicken sit for at least five minutes before you cut into it, to let its juices resettle, and then enjoy your perfect dinner for one. Did you bake it in the bowl thingy in the picture? I have another issue- I like roasting a whole bird but everyone wants the breast- I have 4 bone-in, skin on chicken breasts waiting for the oven. I usually do these latino style with a lot of sazon but I want to try this 🙂 I like the sweet potato idea and the orange– looks good! I love baking chicken this way. I usually put several garlic cloves under each breast and put a few more in the pan. 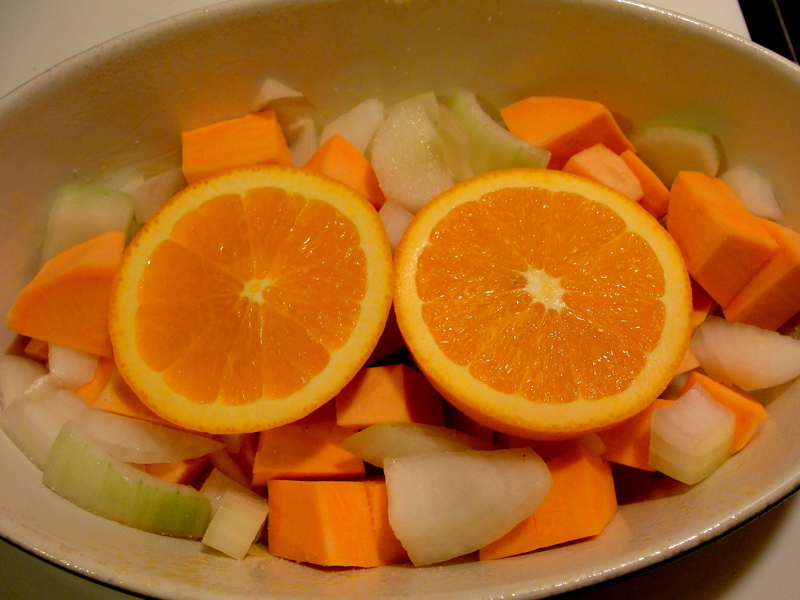 I will have to try it w/ the orange slices – -looks yummy! You are so right! 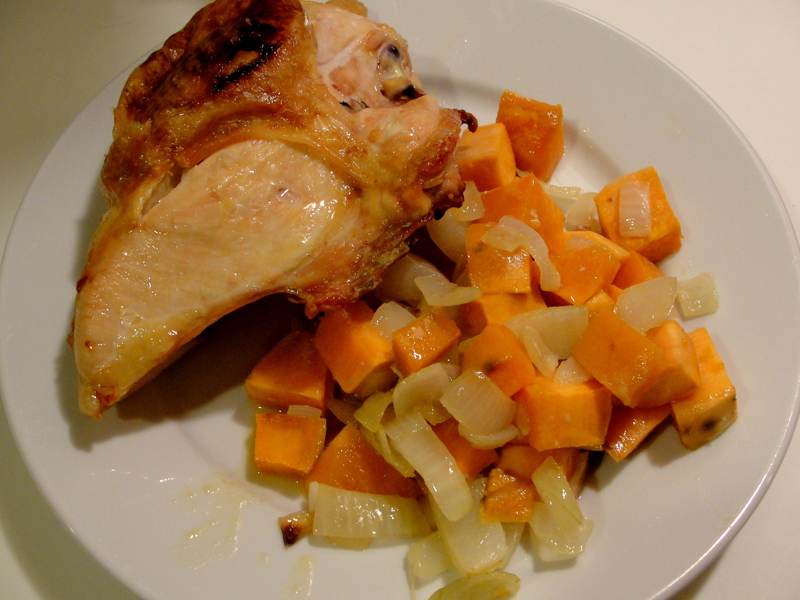 A roasted chicken is about the best quick meal you can have. It is my Friday standard. I, however, use lime (it is my citris of the moment). yum!! Luckily we all like chicken, so doing a roaster isn’t an issue, but this would be great for when I buy the cut up packs and we have extra.